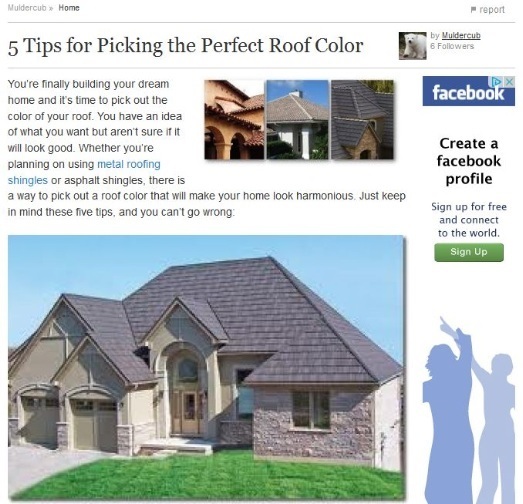 You’re finally building your dream home and it’s time to pick out the color of your roof. You have an idea of what you want but aren’t sure if it will look good. Whether you’re planning on using metal roofing shingles or asphalt shingles, there is a way to pick out a roof color that will make your home look harmonious. A casual drive through Palo Alto’s residential communities may leave you struck with awe at how classy and smoothly designed the houses are. A number are already in Spanish colonial-era architecture, with others in heavily modern designs. If you are aiming to have your house’s roof sport a different color and style, roofing contractors from Palo Alto, CA like Shelton Roofing will help you find a way. The house’s general location and the climate are prime factors in choosing a roof of the right color. According to Muldercub, people living in places with clear weather most of the year should have houses with brightly-colored roofs to reflect the heat away. The result is that the interior is cooler, reducing stress on the HVAC system; remember, however, that the color can ease or complicate roof repairs in Palo Alto, especially in detecting problem areas in the roof. Sometimes, a roof can be more of an eyesore than you think. For instance, you can look at a roof color palette and pick out a color that’s not normally chosen everyday. The effect on the roof may not be positive; Muldercub notes that roofs painted in unconventional colors will only make visitors/passersby focus on the roof instead of seeing the house as a whole. It may be true for tightly-sloped roof designs like the Dormer, skillion and lean-to, or saltbox. The general construction of the house adds to the considerations needed for the roof color. If the house you’re having built is an all-brick or -stone affair, you cannot combine materials of two different colors and expect the roofing to blend with them in the process. Your contractor will aid you in identifying the colors that will fit the style. A carefully-chosen color for the roof can be one of the striking elements that will enhance your house’s appearance. Make it happen with a contractor like Shelton Roofing.